In the race for a cure, there’s no slowing down. Turns out our dogs with cancer may hold the answers to help us reach the finish line faster for One Cure to benefit all cancer patients. Professional NASCAR driver Clint Boyer understands that, which is why this racing season he’s bringing the #OneCancerOneCure message to millions of race fans around the country. When your pet is touched by cancer, you quickly begin to understand how people and pets with cancer share much in common. From how the disease presents to the treatments our pets receive, a cancer journey can look remarkably alike in both species. Many people still aren’t aware of these similarities, but that’s going to change in 2018 thanks to Clint Bowyer of the Stewart-Haas Racing team. 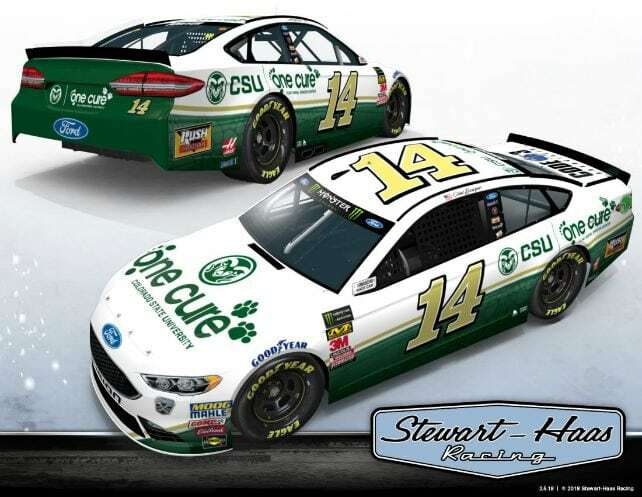 The 38-year old Kansas native, father and dog lover is driving the #14 Ford Fusion race car decked out with the One Cure message. You’ll see the car in primary position in Las Vegas on 3/4, Sonoma on 6/24 and in Kansas on 10/21. The logo will appear on the vehicle and on Bowyer’s firesuit all season as he works to build awareness for the cause. Bowyer isn’t the only driver racing for cancer research and cures. Graham Rahal of the Rahal Letterman Lanigan team is also racing for One Cure on the Indy circuit. 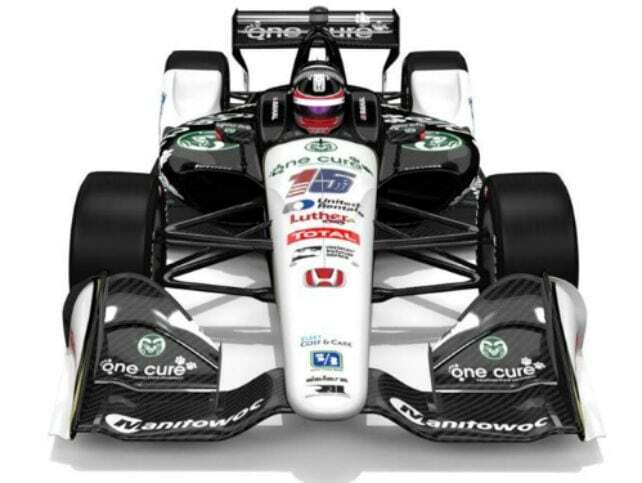 Like Clint he will have the One Cure logo on his car all season and will have the message in primary position in Phoenix in April and Portland in September. 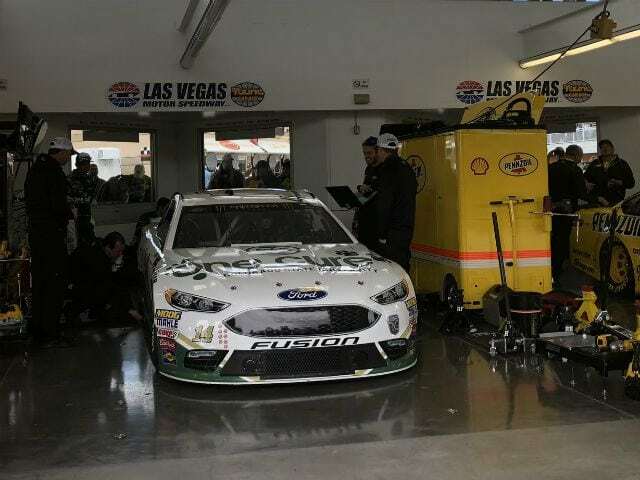 The crew at Colorado State University’s Flint Animal Cancer Center was kind enough to give Team Tripawds a behind the scenes peek at the One Cure #14 car during trial runs for the Penzoil 400 race at Las Vegas Motor Speedway on March 4th. The car sounded as awesome as it looks! One Cure is a far-reaching program guided by the principle that cancer touches every creature. The program is led by the Flint Animal Cancer Center at Colorado State University, which works to improve the prevention, diagnosis, and treatment of cancer in pets. An important mission of the One Cure program is to bring scientists in the veterinary and human cancer research fields together to translate pet cancer research into knowledge that also benefits people with cancer. 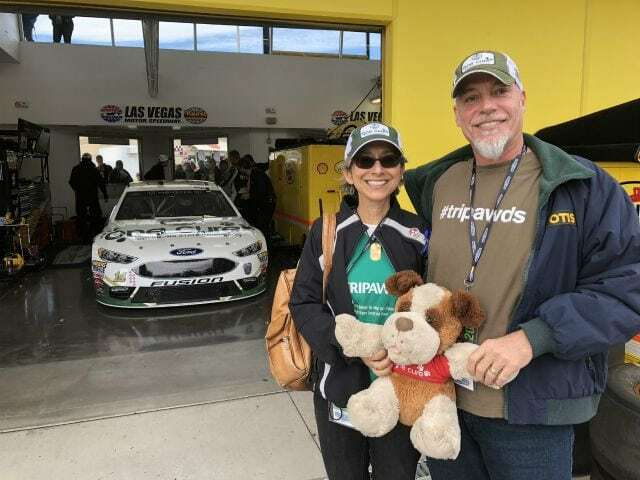 Team Tripawds and the One Cure mascot at the race track. This isn’t the first time One Cure has turned heads on the NASCAR track. In 2017 legendary racer Danica Patrick, also of Stewart-Haas Racing, carried the One Cure banner on her car #10. Millions will learn about comparative oncology research! Now in its second year at NASCAR, the One Cure sponsorship is made possible through a generous donor seeking the widest possible audience for this important cause. Close to 5 million TV viewers will see the One Cure message blazing across their television during each NASCAR race. That’s 5 million more people who may not be aware of how pets with cancer can help cure cancer in people too! Get in the race, donate today! With every new clinical trial for pets and people, One Cure is bringing us that much closer to a cure for cancer. 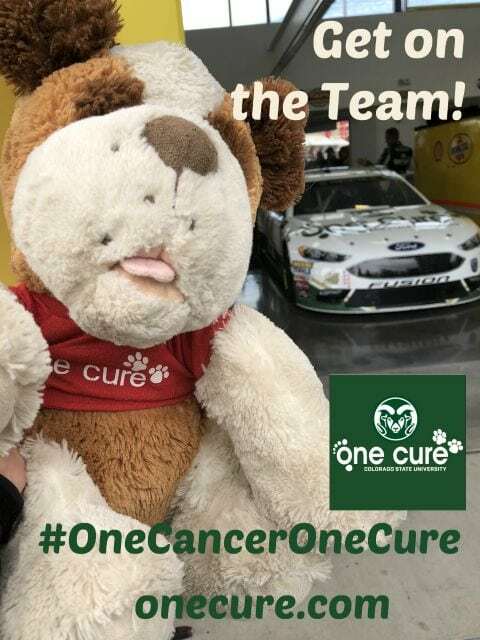 We hope you will consider joining the #OneCancerOneCure team by making a gift to this important program, which helps to fund and support clinical trial studies at the Flint Animal Cancer Center, the largest facility in the world that treats and studies naturally occurring cancer in companion animals. For more information and to donate, please visit www.onecure.com. And of course follow One Cure on Twitter and One Cure on Instagram. Can Your Tripawd Cure Cancer?